Hayder Saeed, M.D., and Suleiman Massarweh, M.D. A 56-year-old female smoker presented with cough, a weight loss of 27 kg over a period of 6 months, and diffuse bone pain. The palms had a raised velvety texture (Panel A), and there was digital clubbing (inset). There was a fixed, tender lump (4 cm in diameter) on the right lower leg and one over the lower lumbar spine. There was also a nodule (1 cm in diameter) in the left breast. A computed tomographic (CT) scan of the chest showed a mass (11 cm in diameter) in the upper lobe of the right lung (Panel B). A bone scan (Panel C) showed areas of uptake of technetium-99m–labeled methylene diphosphonate that were consistent with metastases (arrowhead), as well as diffuse linear uptake in the femoral and tibial bones, consistent with hypertrophic pulmonary osteoarthropathy (arrows). Examination of specimens obtained by CT-guided biopsy of the lung mass and fine-needle aspiration of the breast nodule were consistent with large-cell adenocarcinoma. 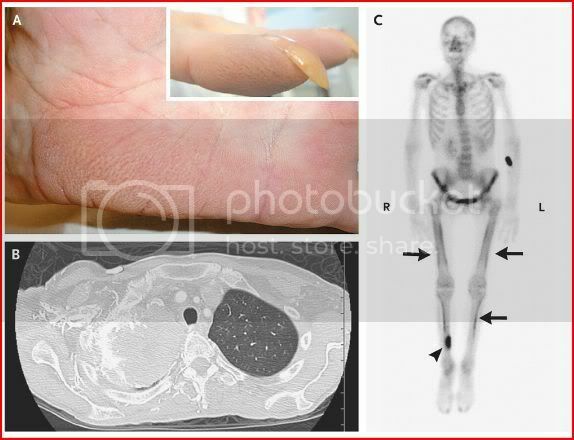 Hypertrophic pulmonary osteoarthropathy and tripe palms (acanthosis palmaris) are paraneoplastic manifestations of, most frequently, lung and gastric carcinomas. The patient was discharged with plans to start outpatient chemotherapy. She received one cycle of pemetrexed and carboplatin, but her performance status declined. Because of worsening bone pain, she received palliative radiation to the lower spine and right lower tibial mass.